Rocket Display And Artillery Firepower At Army's "Exercise Topchi"
"Exercise Topchi" event took place at the vast firing ranges at Deolali Camp in Nashik. 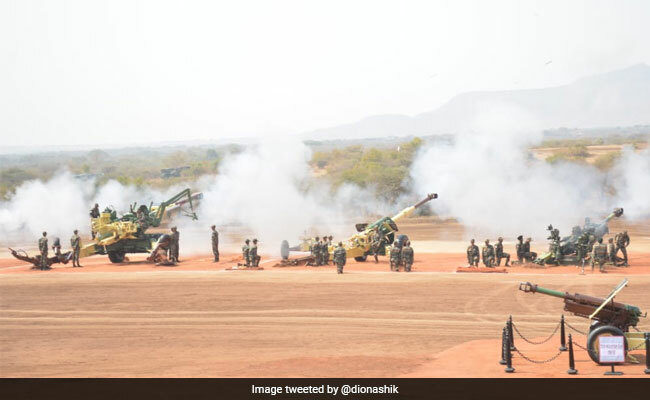 Using ultra light Howitzers and indigenous Swathi weapon-locating radar, Indian Army on Tuesday demonstrated its artillery firepower at the annual ''Exercise Topchi'' held near Nashik. Lt Gen YVK Mohan, Commandant of Defence Service Staff College (DSSC), Wellington, near here, Lt Gen R S Salaria, Commandant, School of Artillery and Colonel Commandant Regiment of Artillery and other Army officials were present on the occasion.